Loaded And Dangerous In London: Pompey Prospect Joel McIntyre Ready For The Limelight. Tony Oakey Protégé Steps Up With London Test Ahead Of Future Challenge For Championship Honours. Back in May 2010 British, Commonwealth and WBU Light Heavyweight World Champion Tony ‘Oakey Kokey’ Oakey announced his retirement from the ring. Some three months or so later Tony could be seen back in his old home from home, The TRAD TKO Boxing Gym deep in the heart of London’s East End. This time however Tony wasn’t the one bringing the gym to a standstill, with a trademark full on sparring war, but it was another Pompey lad - Joel McIntyre. At the time nobody at the TRAD TKO knew who the kid with the crazy tattoos was, but after just one sparring session everyone in the gym knew he was going to be ‘one to watch’ though. Under Tony and TRAD TKO’s Johnny Eames’ tutelage the rough diamond, that was Joel McIntyre, was slowly but surely being polished into a genuine Championship prospect. Johnny has had him regularly sparring with some of the best in the business, former British Cruiserweight Champion Leon ‘Solid’ Williams and British and Commonwealth Middleweight Champion Billy Joe Saunders being just two of the most recent ‘names’ to employ Joel as a sparring partner. It wasn’t enough that the tough youngster could hold his own in sparring against such illustrious opponents though, they wanted Joel to learn his trade the traditional way, so throughout the past couple of years Tony and Johnny carefully nurtured Joel, guiding him through a series of low key fights, mainly at local shows inthe Portsmouth and Southampton area, as they plotted a major launch of the talented youngster to amuch wider boxing audience. After six resounding victories Tony and Johnny felt it was now time to introduce Joel to ‘the big stage’ and what better than to have him compete on the undercard of a televised Heavyweight Title event, to prepare him for a shot at the Southern Area title in the near future. So on Friday night, at York Hall in Bethnal Green in London, on the Loaded TV broadcast ‘Loaded and Dangerous in London’ event, which is headlined by the Matt Skelton versus John McDermott battle for the vacant English Heavyweight title, a star will surely be born when Joel finally makes his long awaited TV debut. Even though the spotlight is about to shine brightly on him, young Joel seemed quite relaxed, about his upcoming big time boxing TV debut, when he spoke earlier. “I’m really looking forward to March 15th, it’ll be my first televised fight. As a kid I’d watch the boxing on TV, even after I started boxing I’d always watch any televised boxing, so who’d think I would be fighting on TV myself and after just six fights. I can’t thank Johnny (manager Johnny Eames), Frank Maloney and Loaded TV enough for the opportunity to fight on this show. Training’s been great, I’ve had the best preparation I could possibly ask for this fight. Billy Joe (British and Commonwealth Middleweight Champion Billy Joe Saunders) asked for me to be one of his sparring partners to prepare for his title defenseagainst Matthew Hall on the 21st March, which will also be at York Hall. Havebeen getting in a lot of rounds with Billy Joe, which really is something of an experience. 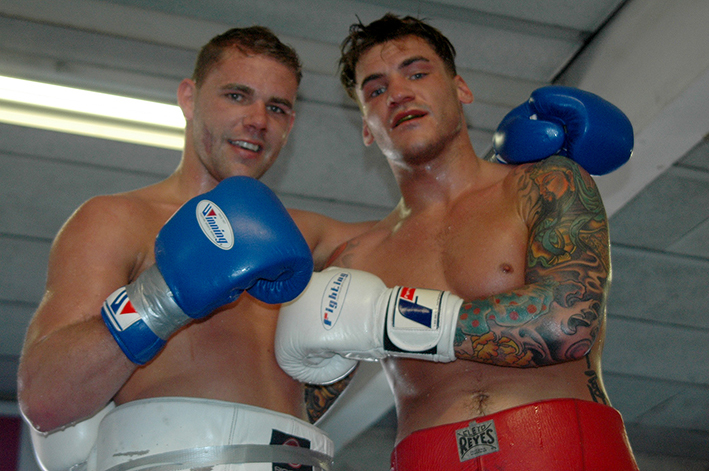 We know each other quite well now, we’ve sparred so many rounds, which is really good and keeps you on your toes. It’s just good to be in the same ring as him, to be fair. I love training and sparring here at the TRAD TKO, but it’s hard for me to do so all the time so usually train with John Murray at VK Gym in Bognor, which has brilliant facilities. As I said I have had the best preparation I could ask for,besides the sparring with Billy Joe, I’ve been getting some serious conditioning work and training. My fitness has gone right up, my weight’s good, yeah couldn’t be more pleased about it really. It’s a Frank Maloney show, you know there’s the poster with some big names on it, Skelton, McDermott, and there’s my name as well. Joel’s esteemed manager, and the UK’s newest promoter, Johnny Eames then added. “So yeah touching on what Joel said, we are looking to move Joel into title contention, we were hoping that Danny Couzens was successful in his challengefor the Southern Area Light Heavyweight title on Saturday night, unfortunately that wasn’t the case. The reason is we’re close to securing the exclusive boxing event rights to a venue on the South Coast, it’s a big venue and we had hoped to have had Danny, who’s a good friend of the gym,having his first defense of the Southern Area title and Joel having his first shot at a title both on home turf so to speak. It would have been a huge local derby, Portsmouth versus Southampton is always a huge event no matter what sport. That’s not to be, but new Southern Area Champ Leon Senior is from Swanley in Kent,I’m pretty sure he would bring a big crowd if we can make the fight in a couple of months time. It will be Joel’s seventh fight on Friday, he’s improving so much all the time, when he’s in the gym regular. We’ve changed his training regime around, which has helped him a lot because he can spend a bit more time at home. John Murray has definitely improved his fitness, without a shadow of a doubt and now Joel has the best of both worlds, as he comes up here for a bit of tuition and quality sparring. We’re looking for Joel to take over the South Coast from Tony Oakey, who is his mentor and someone that bought Joel to the gym in the first place. Joel still has Tony’s backing, we speak regularly on the phone. He called last Saturday and said how much he’s looking forward to Joel getting his first title fight. We want to take him the same route as Tony, Southern Area, British and Commonwealth titles and of course World Champion. Tickets, priced £30 and £70, for the Frank Maloney promoted ‘Loaded and Dangerous In London’ event at York Hall on Friday 15th March, are on sale now at www.tkoboxoffice.com or direct from Joel McIntyre at the TRAD TKO Boxing Gym, Gillian House, Stephenson Street, Canning Town, London E16 4SA.